If, like me, you hadn’t heard of the contemporary dance technique of Flying Low and Passing Through, you can look online for founder David Zambrano to get a full account of what he teaches. Briefly, he discovered over the course of rehabilitation for his injured feet how to use the floor to develop the dynamics of the rest of his body. Once he had regained the strength in his feet, Zambrano developed his technique that his friends jokingly referred to as Flying Low. Passing Through is a further development of his technique through improvisation. 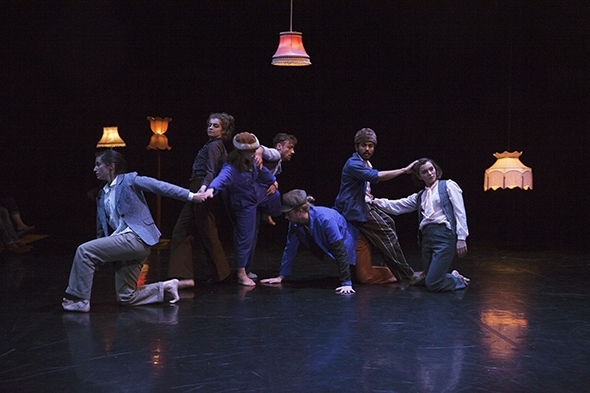 Choreographer Leila McMillan teaches the technique and has based her new work on its principles, though Family Portrait is perhaps less a demonstration of the technique as it is a framework for the improvisational play of one-upmanship that McMillan and the cast have developed. It is hard to imagine a more heterogeneous family than this one: Faith Prendergast, Karl William Fagerlund Brekke, Karolina Kraczkowska, Monsur Ali, Martha Passakopoulou, Typhaine Delaup and Danilo Caruso. McMillan clearly relishes the diversity of the performers, not only of their characters but of their physical attributes — most noticeably the disparity in sizes between Brekke and Prendergast. What unites them is a wicked sense of humour that Paolo Fiorentini has brought out in his costumes topped with a selection of rakish hats that make these children chic and colourful on top of their natural exuberance. The set by I. Carlos is enclosed on three sides by banks of seating in The Borough Hall at Greenwich Dance, a stage emptied of furniture except for guitarist Domenico Angarano’s seat and musical equipment in one corner. Ben Pacey and Emerald Faerie light the stage to the intimate scale of the family with a selection of floor lamps and hanging chandeliers created by Faerie herself. Silence descends on the room, a long silence in the dark broken by the creaking hinges of a metal door and the sound of scampering feet. The siblings emerge from the shadows in a tight group with what seems like trepidation but each is already wondering how best to upstage the others. This is no collection of shrinking violets; the stage is their frame and they make a point of presenting their best face to each of the three sides of the auditorium as if posing for a photographer. Each successive pose becomes a little more complicated, elongated and manipulated as the improvisation develops according to the machinations of each character. Delaup soon emerges as a provocateur, always smiling even while she is obstructing someone from the frame or throwing herself into it. Kraczkowska is the eccentric, duly unconcerned with all that is going on around her but managing to take centre stage whenever possible. There is something of the clown in her that permeates the flying low and passing through, giving it a character that is all her own. Angarano’s guitar accompaniment enters into the sense of fun, plucking notes and playing riffs on the behaviour of the family, colouring it as well as taking it on a journey. In a sense he wills the dancers to continue without directing them. The opening section is quite slow and subtle as the performers attune to each other’s movement tics and traits but the improvisation soon starts to open up as Prendergast and Passakopoulou drag Delaup out the frame and the subsequent groupings become more hilarious and bizarre: Brekke is upturned, the hats are passed around, Kraczkowska removes Prendergast by her overalls as if she is a carrier bag and there are headlocks and tripping over each other in the clambering for position. The Japanese have a saying that the nail that sticks up is always beaten down, and Brekke seems to suffer from the truth of this as he is cuddled, straddled and bent over to the height of his siblings. He subsequently uses his height to disguise himself as a lampstand until Kraczkowska tries to lift him into the light socket. Passakopoulou presents the lining of her jacket as a bullfighter’s cape, Kraczowska delivers a breathtaking improvisation in the middle of the bustle and then everyone is running. Angarano gets swept to his feet and enters into the rhythmic swirl as the children fly around the room. The hustling and scurrying reaches a climax when Brekke throws himself to the ground in what appears to be a series of fits. The mood changes to one of inward contemplation and the more extrovert siblings begin to tire. Ali and Caruso, like late developers, start to emerge into the light but nothing, it seems, will tire Kraczkowska’s imagination and drive; she makes wings of Passakopoulou’s shirt, picks up Prendergast again and tries to plug her into one of the lamps and finally puts on all the hats, framing herself between two lampstands as the others withdraw to watch the remnants of their family portrait. The lamps dim, Angarano resolves the music beautifully and all is quiet again.